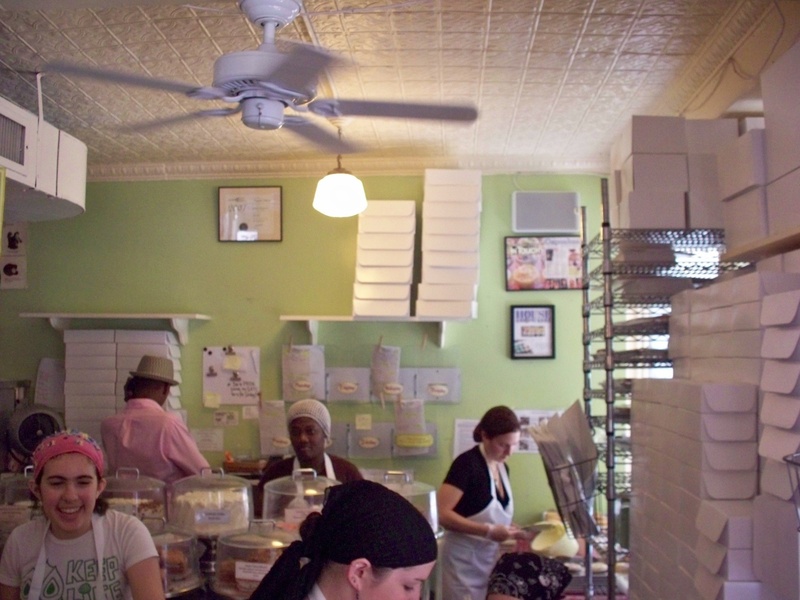 The bakery is small and filled with the soft, sugary smells that go perfectly with the pastel colors throughout. The summer day my sister and I stopped in, it was filled with young women laughing and glistening with a sheen of sweat– busily baking, frosting, wrapping, and ringing up cupcakes as quickly as customers could fill a box. This was stop #3 on our cupcake tour of NYC and we made it only to a stoop around the corner before we sat down and devoured a cupcake and a half a piece in a matter of minutes. This “trend” has spawned I would imagine hundreds of new businesses all over the country whose specialty is this tiny little cake that evokes so many memories for so many. Close your eyes and try to remember your first cupcake experience. Maybe it was your first birthday… I know I cannot remember that far back, but someone close to me claims he can. For anyone over 40, the cupcakes you remember as a child did not come from the Kroger bakery or from any bakery… they came from your childhood kitchen, baked by your Mom for your class birthday party. As a young parent, I found such joy in recreating those moments for my own children, taking baked cupcakes for my boys on their birthdays to preschool and later elementary school for class parties. I even had a special carrying case to carry them in.. it held thirty cupcakes and got them to school with every dollop of frosting completely intact. Unfortunately, today in quite a few of our schools, home-baked goodies aren’t even allowed and only store-bought confections can be doled out at class parties. I assume this is due to the proliferation of children with food allergies and the need to know exact ingredients and have some measure of accountability, but how sad that the few moms and dads who actually have time to bake are no longer allowed to contribute in this way. Homemade cupcakes can still be found at home parties and even weddings. Young mom’s and kids everywhere are now out doing us by making cupcakes that are literally works of art. My sister and her teen daughters have even made some of the cupcakes featured in the wildly popular cupcake book Hello Cupcake! Go to Amazon and type in ‘cupcakes’ under books and you will find 1,111 hits. 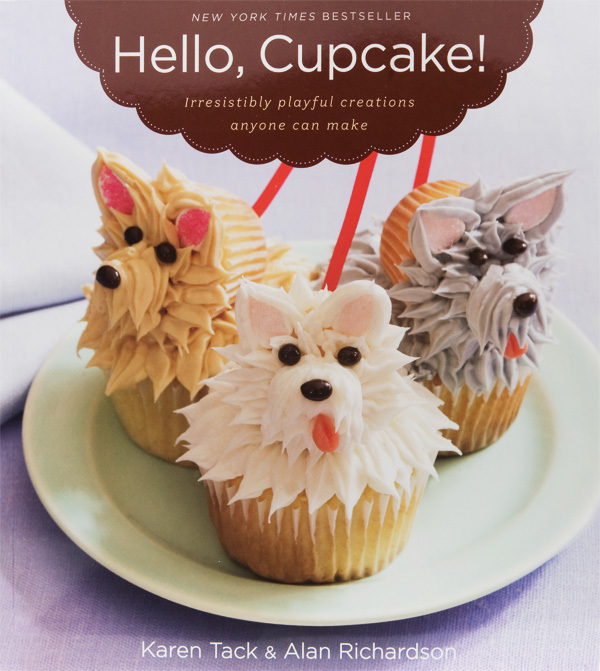 I even found a cupcake book about the Magnolia Bakery. 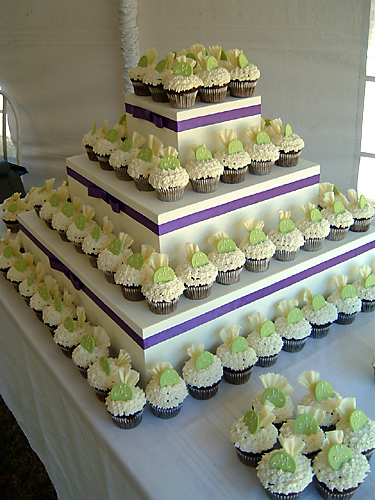 The cupcake wedding cake has become somewhat of a trend in the past five years or so. This choice is often cheaper than a large, elaborate cake and a larger variety of flavors can be offered for guests. 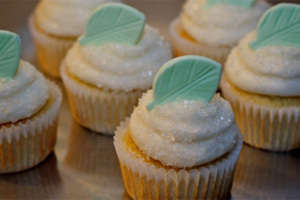 The Cupcake Bar in Cary, NC [who knew] sells cupcakes flavored like your favorite drinks with flavors like Mojito, Mint Julep, Strawberry Daiquiri, Mocha Latta, and Chai Tea. 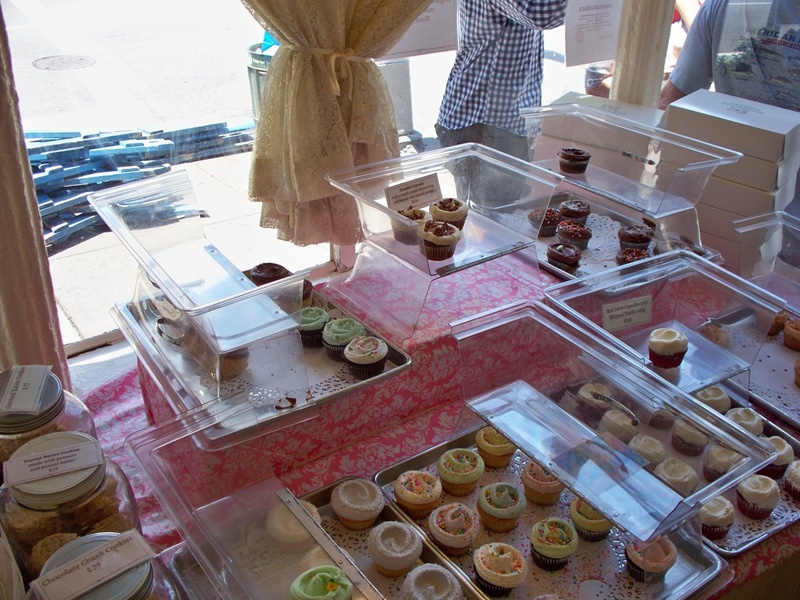 They also have house favorites like red velvet and traditional flavors as well as filled cupcakes. Top shelf cupcakes are $30 a dozen plus a delivery fee [if delivered to your home or office]. They appear to be doing a booming business despite the economy. The gourmet cupcakes found at these homespun businesses are a giant improvement over the grocery bakery cupcake and even a notch up from ordinary homemade cupcakes. But, at often more than $2 a cupcake, they are pretty costly. I can see buying these for an office function or a party or occasion, but not simply picking them up for the family very often. Two female marketing majors fresh from the UNCW school of business are whipping up interesting and delicious flavor combinations at Coastal Cupcakes in downtown Wilmington. 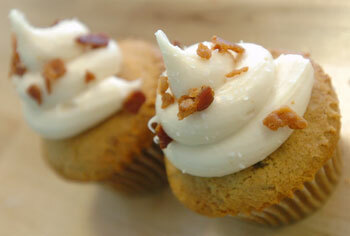 Last year they developed the bacon cupcake that tastes like, yup, bacon. It’s on the savory side– a crisp cupcake infused with crunchy bacon pieces and covered with a creamy sweet maple cream cheese frosting along with some sprinkles of sea salt. People line up out the door to get these cupcakes and they have sold out nearly every time they have had them. Cupcakes first appeared in the early 19th century. Some people say they were named for the cups they were baked in and some people think they were named for the measurements needed that were mostly measured in cups. I picture them as a very 60’s confection, but apparently they were no more popular in the 50’s, 60’s, and 70’s than they are today. They are simply a nostalgic item since so many people associate them with their childhoods. In England they are known as ‘fairy cakes’ since they are just the right size cake for a fairy. The original cupcake bakery is Sprinkles in Beverly Hills, CA which now has almost 10 locations with a dozen more to come shortly. A Sprinkles is even in the works for Charlotte, NC. Most of the cupcake bakeries that have sprung up all about the country have modeled themselves on this original chain. They are pricey, though, with some upwards of $50 a dozen plus at least a $15 delivery fee. If you’re figuring, that is more than $5 per cupcake, so I would say they’d better be more than just good. According to an article I read on Slate, the bubble is already here and the crash is coming. This author believes that the cupcake is an affordable luxury riding the coattails of the recession and that after the recession recedes, the cupcake bubble will burst. I personally do not see how cupcakes alone can float a bakery, especially in a small city or how numbers of cupcake bakeries can compete in larger markets, but I do love a cupcake.